Hollywood star Harrison Ford was injured Thursday when the small plane he was flying suffered engine failure and crash-landed on a golf course outside Los Angeles, officials said. 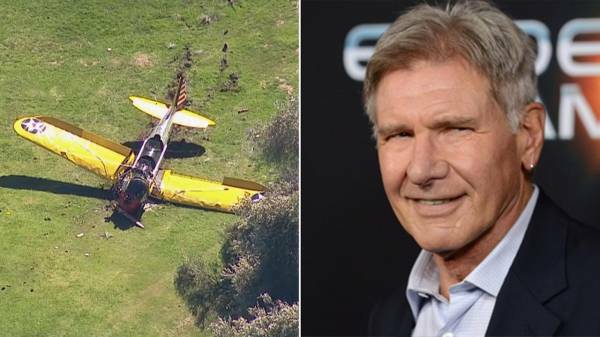 The 72-year-old “Indiana Jones” and “Star Wars” actor suffered multiple gashes to his head and was left bleeding after the crash of the vintage two-seater plane, according to the TMZ celebrity website. “At the hospital. Dad is OK. Battered, but OK! He is every bit the man you would think he is. He is an incredibly strong man,” said Ford’s son Ben in a tweet. “He was banged up and is in the hospital receiving medical care. The injuries sustained are not life threatening, and he is expected to make a full recovery,” added the star’s publicist, Ina Treciokas. The striking yellow-silver plane — which was left with its nose cone ripped open after the crash — had just taken off from Santa Monica Airport. “I’m sure the pilot was glad that there was a golf course here,” said Patrick Jones of the National Transportation Safety Board (NTSB). A Los Angeles Fire Department spokesman, who did not identify Ford, initially said the pilot was critically injured, but that was later changed to moderately hurt. “When we arrived on scene we had a small aircraft that was down on Penmar Golf Course, near the Santa Monica Airport,” spokesman Erik Scott told AFP, recounting the early afternoon crash at the golf course in Venice, southwest of Los Angeles. The KTLA television station cited witnesses as saying Ford was helped out of the plane by bystanders on the golf course, and that he could use his legs. TV pictures of the aircraft showed that it had gashed a stretch of grass on the golf course before coming to a halt the right way up. The crash is expected to be investigated by the National Transportation Safety Board (NTSB), said the LAFD spokesman Scott. Ford was flying a Ryan PT-22 two-place open cockpit trainer, one of many hundreds manufactured during World War II to train US military pilots. Built in 1942, with a 160-horsepower radial engine and a top speed of 131 miles per hour, it was retired by the military after the war, and eventually fell into disrepair, according to a 2008 feature in AOPA Pilot magazine. It was acquired in 1992 by an Illinois design engineer as a restoration project, and went on to win the prize for best antique airplane at Oshkosh, the world’s biggest air show, in 1998. It went on to be sold to a new owner shortly afterwards, and is currently registered in the name of a Delaware company, according to FAA records. Ford took his first flying lessons in college, gave up due to lack of money, but got back into it after becoming an established film star. He has been the owner of several planes, from two-seat bush aircraft to corporate jets. Last June, Ford broke his leg on the set of the new “Star Wars” movie at Pinewood Studios outside London. Filming began in May last year on the new episode of the iconic franchise, directed by blockbuster filmmaker J.J. Abrams. Ford is back as smuggler Han Solo, Mark Hamill will return as Jedi Knight Luke Skywalker and Carrie Fisher, 57, reprises the role of Princess Leia. The veteran actor remains one of the biggest names in Hollywood, in a glittering career stretching back decades.